Th-INK-ing of You: MMSC26 and CC243... A Savior Has Been Born! MMSC26 and CC243... A Savior Has Been Born! Hello everyone! I got to play a little this morning and made this card for the Midnight Madness Sketch Challenge and for Design Team mate Betty's Color Challenge on SCS today. We were to use neutrals for our papers and then used a colored stamped image for a pop of color. I think I followed the rules! The sketch this week is fabulous! I sewed my textured strips together to make a fan, added a T Holtz corner piece and mounted on Vanilla CS (Papertrey), Brushed Gold (The Paper Co) and the designer paper was The Paper Pazazz. I started out thinking clean vanilla and gold... but as I went along this fan just shrieked that it wanted a more vintage feel so I sponged some T Holtz Distress Inks on all my layers, thus fitting the OCCC challenge to do vintage! The Poinsettias are from the newly released sets at Our Daily Bread Designs... one is from Luke 2:11 and one is from Blessed Christmas, and the sentiment is from Luke 2:11. They are heat embossed in Fine Detail Gold by Ranger and I stamped 4 flowers so I could cut some out and paper tole the layers. The scrolls are the negative part of an EK Success edge punch. The lace is Spare Parts, the red velvet is Prima, and the gold beads are Recollections. I used 3 Cuttlebug embossing folders and the sentiment is cut out with the Spellbinders Label #6. I love how this came out... and if you know me, you know I don't often say that. It has a feel to it that I really do love... I hope you do too! You still have until 8:00PM EST tonight to complete the ODBD Blog Hop! See the post below this or click here to go to the ODBD Blog post where the hop begins! There will be one blessed winner who will receive the ENTIRE New Release!!! Besides that... the DT has some fabulous inspiration for you! Sit a spell and enjoy the hop! Thanks for stopping by! I love to know you've been here! Be blessed today! Outstandingly beautiful!! Love your colors and flowers. You are an wonderful card crafter!! The MMDesign Team thanks you for playing with us week and we will be looking for you next week too!! Grace you know I LOVE this! It's stunning! Amazing! Gorgeous! Beautiful! Fantastic! I can't think of enough words to say about this creation! WOW!!! Grace~You sound exactly like me when saying that you never say that you like your own work. However, I always love EVERYTHING that you create. This one is no exception. I think it is absolutely breathtaking! The gold and the gold embossing make it look like such a rich and elegant card. Just hard to stop looking at! I so love coming to see all that you come up with. Such wonderful inspiration here in every way. Thank you for playing with us at the MMSC. We hope to keep you with us for a long time to come!! This is stunning Grace!!! 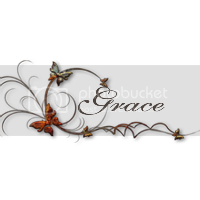 I just love the velvet ribbon, the embossed and red poinsettias!! Stunning work!! What an awesome job on the sketch!! Breathtaking and elegant my friend!! Grace you have done it again. You have "Graced" us with another piece of your exquisite work. This is absolutely gorgeous. I love the vintage feel to this. Outstanding. Thanks for playing along with us this week...we appreciate your support. Thanks so much for joining us this week at MMSC! Beautiful Work! Grace this is just stunning, I love the beautiful texture and colors! Wonderful card Grace. I love all the embossing. Beautifully done. Grace this is GORGEOUS!!! Oh my word I LOVE the gold accents!!! Beautiful work! A beautiful card for the most glorious announcement ever made on this earth. I love visiting your blog and I love your new background. You make those??? I wish I knew how to do that!!! I am always so fortunate to get to hear my favorite, Christ Tomlin everytime I come too. Keep spreading the good news in all the beautiful ways you do it, Grace! oops, make that Chris Tomlin!! I should proof my comments better!!! Oh my word Grace this is GORGEOUS. Another beautiful card with the embossing. Just love it. This is just beautiful! 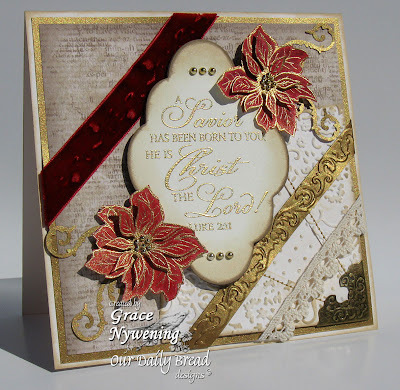 I love the gold embossing, the beautiful poinsettias and the wonderful verse! Grace your artwork blows me away! Absolutely stunning! Absolutely STUNNING Grace!!!! Love all the gold with the neutrals and the pop of red is just divine!!! Love how you used the verse on the Label 6 too!! Oh Grace!! This is just sooo beautiful!! Love the gold accents...so very rich!! Gorgeous card Grace. You definitely have the elegance down.. I love the rich colors.. Have a great weekend and visit.. I am sure it will keep you busy.. Very stunning card! You should really be teaching as you are so talented!!!! I love your music on your blog. It always comforts me..
hi!im martha of mexico, my english it so bad, but i need to tell you, i love your card!its beautiful,love the colors,the doodles ande the flowers,congratulations! Grace, another stunningly beautiful card from you. It's always such a delight to see what you make. Thank you for sharing your lovely talent with us each week.